Our April update looks at an upcoming 'Technology Day' event packed with turbomachinery expertise, reveals our latest paper of the month and revisits some unique consultancy work. The 'Technology Day' is Turbomachinery & Simulation: From Design to Optimization and will take place in Würzburg, Germany on May 8th 2019. Register for a place today. If there is enough interest we will look to hold more of these events in different countries to give as many people as possible the chance to tap into the turbomachinery design expertise on show. Our April paper of the month is Choice of Optimum Blade Loading in Application of 3D Inverse Design to Design of Pumps and Fans. The paper describes how a 3D Inverse Design approach is able to create breakthrough pump and fan designs as well as remove the need for time-consuming trial and error development. Following on from the blade loading theme, optimizing the blade loading to achieve target pressure ratios played a key role in the design of a chiller compressor. ADT engineers designed a chiller compressor for domestic CHP using the refrigerant R1233zd(E) that had challenging efficiency requirements and a wide operating map. 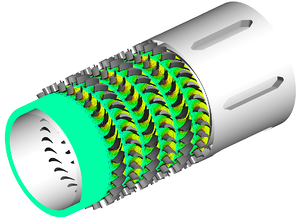 Another example of our consultancy services is the optimization of a high-torque turbodrill turbine. Our engineers achieved target requirements that no conventional design could meet and one that could operate with both high torque and low runaway speed. Once again careful control of the blade loading was an important part of the design process. If you want more like this to drop into your inbox, sign up to receive relevant updates from us below. Letting us know your interests will help us tailor our content so you only receive what's most important to you.